This week has been manic. Not just work (orders, craft fair this weekend, a writing job that came from nowhere, website updating, blogging, etc) but other stuff too: babies, children, elderly people - all needing time and attention. I did mention here that I managed to move the studio into the garden for a little sunshine - how lovely the weather has been! It makes such a difference when the sun shines, doesn't it? There's not much to report on the stitching front - but I did manage to run up this cushion for my Mum's 85th birthday. It's difficult to know what to get when someone gets to that age (she always tells us she has everything she needs!) but I guess a cushion is always useful to rest your weary bones, whatever your age. I'll be resting my weary bones this evening too, after my craft fair weekend at Kenyon Hall Farm - while my feet are up I'll be popping round to read all the blogs linking up to Handmade Monday. Do join me! Hope the event went well - lots of people buying and placing oodles of orders. The cushion for your mum is lovely and I am sure she will be very pleased with it. Hope you have a good week. It's a lovely cushion Wendy, I'm sure your mum will love it. I have her visiting for a couple of weeks and it's lovely. She'll be 84 in a June. craft fair? tell me more :) hope it all went ok for you. all these summer events seem to be popping up not one after the other. so much to choose from and be at! ive got 4 coming up! 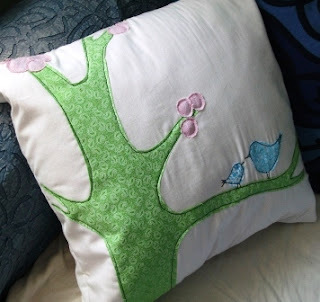 I'm sure that your mum will love her cushion Wendy and appreciate the thought and care that went into creating it! The sunshine has been fabulous hasn't it? Gorgeous cushion and such a good idea. I never know what to give my Dad for his Birthday so maybe something like that would work. Sounds like you could do with a cushion to rest your weary bones on after such a busy week Wendy! I really like the stylised approach you have taken, it give the cushion such a jaunty air. Reminds me of 1960s cartoons, that always left you feeling really happy without a care in the world. I think you can say I really like it!